Last week, Galleria Hair Design salon hosted its 3rd Annual “Day of Beauty” for the participants of GLIDE’s Women’s Center Moving Beyond Survival (MBS) Program. The women received haircuts, dyes, conditioning, styling and facials from a team of talented stylists as part of their journey towards self-love and healing. Moving Beyond Survival is a series of 6-week support groups for women survivors of domestic violence. These women have consistently participated in the Center’s drop-in support groups, and are ready to take a closer look at personal histories to get to the root of risky behavioral patterns. The “Day of Beauty” came at the completion of one MBS’s three phases. A graduation is also held at the end of the 3rd phase, giving the women the opportunity to share their personal stories of transformation with the community during a Sunday Celebration. 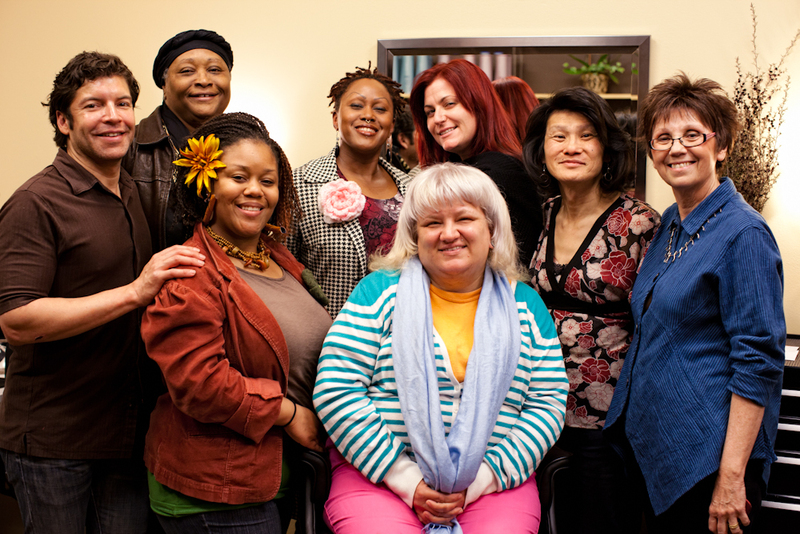 GLIDE Church Member Elliott Eaton first brought the idea of a “Day of Beauty” to GLIDE Women’s Center three years ago. Elliott was inspired by the work the women were doing, and wanted to treat them to a well-deserved day of pampering. He shared his vision with Women’s Center Program Manager Zwazzi Sowo as well as friend and GLIDE Ensemble Member Erran Andrews, stylist at Galleria Hair Design. Erran loved the idea and presented it to the salon’s owner, Eric Hooten. Read a blog post about the “Day of Beauty” from Billy Priest, stylist at Galleria Hair Design. What a brilliant idea! As an old chum of Elliott (aka Scooter!) Eaton it does not surprise me a bit that this was his idea. Gone but not forgotten…thank you Elliott. Bless.